We understand that we can’t script the future. 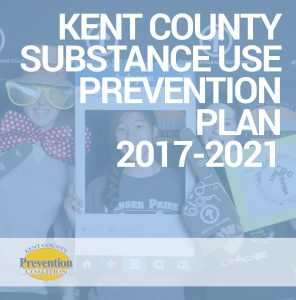 However, when it comes to safeguarding our community’s children from harmful substances like drugs and alcohol, the KCPC, takes pride in its multi-year strategic plan. The plan encompasses the most comprehensive, relevant data from community stakeholders ranging from parents to professionals, and just about every group and association in between. But perhaps most important is that the plan is not just factually-based, but reflects the people, partnerships and passion of the community – something that can’t be captured in numbers. The plan is designed to be a living, breathing document in the community; seen as visible, valuable and vocal in its urgency to promote health and wellness in Kent County. Not only does prevention work, but community coalition-building and collaborative problem-solving are proven to prevent and reduce the onset of substance use disorders. We ask that individuals, agencies, businesses, and community groups of all sorts not only endorse this strategic plan, but where appropriate incorporate the plan’s goals into your own agendas.